The Razer Hammerhead USB-C ANC earbuds offer compelling sound and effective noise cancellation, but USB-C and uncertain compatibility limit the versatility of these headphones compared to the competition. The Razer Hammerhead earbuds have seen a number of iterations, and with the 3.5mm headphone jack slowly disappearing, it only made sense for there to be a USB-C model. 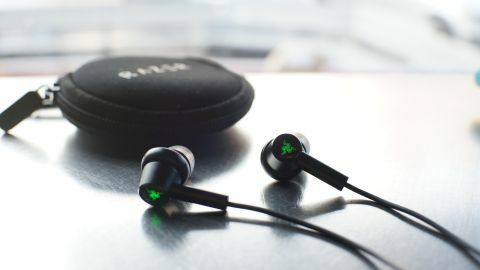 But, not only did Razer release a more suitable pair of buds for the evolving Android phone landscape, it went a bit further by offering active noise cancellation (ANC), while still keeping the price at a reasonable $99 (£79.99, about AU$140). While that's still a good price for a pair of solid earbuds, at this price, they run into competition from some of the best earbuds, like the $100 (£100, about AU$168) 1MORE Triple Driver in-ear headphones, the $99 (£89, about AU$125) Sennheiser Momentum In-Ear headphones, and even the $199 (£200, about AU$335) 1More Quad Driver In-Ear headphones when a good sale is going on. While the competitors lack ANC and use 3.5mm jacks, they’ve got serious audio chops and can connect to phones with USB-C dongles when needed. The flexibility of these other earphones over the Hammerhead USB-C ANC make it a somewhat hard sell for earbuds that will only be compelling for specific cases. The Razer Hammerhead USB-C ANC use a braided cable that runs up to the thin in-line control. The control is made from aluminum and has three buttons for controlling volume and playback, handling calls, or activating a voice assistant. A switch on the side of the control toggles ANC and has a blue indicator light. The in-line control lacks any sort of clip though, which leads to it bouncing around a bit while walking. The result is a lot of unwanted cable noise that gets added to the music. From the control, rubber wires split toward each headphone, with a small box for the microphone midway up the right earphone cable. The headphones themselves are also made with aluminum. The green Razer logo is underneath a bit of glass/plastic on the back of each headphone, and it lights up when the headphones are plugged in. The main body of the headphones are a fairly typical size for earbuds, but these are the in-ear style which extend into your ear canal for a snugger fit and offer more passive noise isolation. Razer includes three different sizes of silicone ear tips for the headphones as well as a pair of Comply foam tips. With the ear tips removed, we can see a metal grille over the channel for sound to come out — a nice touch for preventing clogs from debris and earwax. Aside from the lack of a clip on the in-line control, the only real downside we see from the design are the always-on Razer logos. We did notice one unexpected effect as a result of the aluminum construction, however: when it’s below freezing outside, the earbuds act like highly effective heatsinks for your ears, sucking the heat out and making winter weather that much more miserable. Otherwise, the headphones feel well-built, and the combination of a braided cable and handy carry case help avoid constantly tangled wires. The Hammerhead USB-C ANC boast high-quality audio, and for the most part deliver it in spades. The digital-to-analog convert supports 24-bit/96kHz audio, which is generally more than enough quality for MP3s and streamed audio. Listening to complex songs from FLAC files, we don’t notice any sort of compression, though the EQ balance is a different issue that we'll cover in a second. The headphones work using dual drivers, with one dynamic driver for the bass frequencies and a balanced armature driver for the higher end of the spectrum. The resulting audio is powerful across the spectrum. The mids are punchy, standing out especially in the vocals so, if you’re a fan of hearing the lyrics, the balance is likely to be favorable. But, we feel it’s definitely pushing the vocals further forward than they needed to be, taking some of the richness out of complex tunes. That push comes at the expense of the bass and higher frequencies. They aren’t lost to the mids, but they aren’t as distinct. We can always feel the presence of the bass while listening to music, but it can get a bit overwhelmed by the mids. A smooth bass line in a song won’t come through as clearly as it ought to if there’s a strong vocal going on at the same time. The high end remains clean. Cymbal hits sound crisp without just turning sibilant. The long intro of Heart of the Sunrise features lots of cymbals cruising along with an unstoppable bass line and some atmospherics, and the cymbals are crisp all the way through. But, they do get lost in passages with a lot happening in the mids. In terms of soundstage, the audio can feel a bit close, making it harder to pick out distinct parts of music. Complex tunes like Of Montreal’s don’t have the same lushness they would get from a more spacious soundstage, and that’s even more the case when Kevin Barnes’ vocals overtake the rest of the audio spectrum. The passive noise isolation of the earbuds doesn’t offer much regardless of the ear tips used. It’s fairly easy to hear what’s going on around us when we have the headphones in. The ANC can reduce some of the noise, and we found it competent for removing the lower drone from train rides, but it comes with its own bit of white noise added to the mix. We don’t feel the ANC on these does much more to reduce outside noises than extra passive isolation could. The built-in microphone is nothing exciting. Speaking normally with it resting on our chest, our voice is a bit muffled, and even speaking directly into it doesn’t result in dazzling clear sound. All the same, it does the job of hands-free calling. Given their portable form factor, the Razer Hammerhead USB-C ANC sound good. For anyone that has a smartphone with no headphone jack, they can make for a premium headset with the added perk of ANC. But, support isn’t universal. Razer has a short list of supported phones and leaves the rest in doubt. We tested these mostly on a OnePlus 5, which is fully supported (though we had to go into advanced settings and activate OTG storage every time we plugged them in). Other USB-C phones may work, but some just as well may not. We also plugged it into a Razer Blade, and it worked without a hitch despite no mention of support for laptops. Given the question of compatibility and the price, anyone who doesn’t specifically need ANC and USB-C headphones can probably be better served by other earbuds. These are good, but the 1More Triple Driver and Quad Driver earbuds offer superior audio, good passive noise isolation, as does the Sennheiser Momentum in-ear headset. Those headphones all use a 3.5mm headphone plug, making them compatible with headphone jacks and USB-C devices using a dongle. Meanwhile, the Hammerhead USB-C ANC won’t be plugging into a 3.5mm jack any time soon.